Many well water illnesses, contaminants, and injuries can be related to drinking water or bathing water problems that may be found in your own well water. Waterborne diseases are caused by organisms that can be spread directly through your household water system. For example, Cryptosporidium can be spread by drinking contaminated water that results in diarrheal illness. 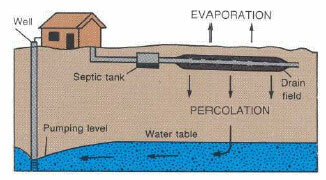 Proper well water treatment and sanitizing are critical and are your responsibility on your own well. Water related illnesses that spread diseases can occur due to a lack of safe water for use as drinking water, good water related hygiene or lack of sanitation. Clean water, improved hygiene and proper sanitation facilities can prevent diseases from occurring. It is important to know how these diseases and contaminants can affect you, where they are found, and how you can reduce your chance of getting ill or suffering injury. The information on this site will help you to make informed decisions about your own whole house well water, well water related hygiene, and sanitation related activities.